Newly-divorced parents may worry about the conflicts that arise as they navigate a shared parenting arrangement. Some parents base a decision to seek sole physical custody of their children on the fact that they’re unable to interact with their former spouse without a fight breaking out, and they want to spare their children from bearing witness to yet more fights between their parents. This line of thinking might not result in the greatest benefit to the children involved. New research shows that children are more likely to reap a greater benefit from having a relationship with both their parents than they are to suffer negative consequences from seeing their parents in conflict with each other. National statistics reveal that about 80% of all court-based custody disputes result in a mother receiving full physical custody. In some of these cases, the children’s father may pose too great a safety risk to hold shared custody of his children, or he may have moved to a new state or country. In many cases, however, the court’s decision to award sole custody to a single parent is based on a concern that providing an opportunity for parents to interact on a regular basis will only expose children to more conflict, or result in parents pressuring their children to take a side. Reducing these opportunities for conflict by providing dads with very limited visitation time may appear to provide children with greater stability. While stability is important, a robust relationship with both parents seems to play an even greater role in creating good outcomes for children. 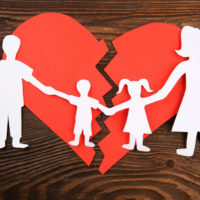 Linda Nielsen, a professor of psychology at Wake Forest University, conducted a survey of years of studies on divorce and children, examining the effects of conflict between divorced parents on their children. Based on this research, Nielsen concluded that “[t]he role of conflict has too often been exaggerated and should not be the determining factor in child custody decisions.” She found that children who had the opportunity to develop close relationships with each parent through spending a substantial portion of their time living with that parent experienced better outcomes, even if those parents continued to fight or had not developed successful co-parenting techniques. “Of course, it bothers kids when their parents quarrel. Conflict does matter. But what we’re saying is that the quality of your relationship with your parents matters a whole lot more than the parents’ relationship with each other,” Nielsen explained. Prior research also backs up the conclusion that children are better served in the long run when parents share custody. Dr. Ned Holstein, the founder of the National Parents Organization, stated that children “do considerably better on every measure, from school success, to fewer teen pregnancies and drug use, to having optimism for the future” when their parents share custody. Nielsen suggests that, “rather than assuming that joint physical custody is not an option,” both parents should focus on fostering strong bonds with their children. If you’re planning to divorce in New Jersey and want to ensure that your right to custody of your children is protected, contact the knowledgeable and effective Union family law attorney John B. D’Alessandro for a consultation, at 908-964-0102.